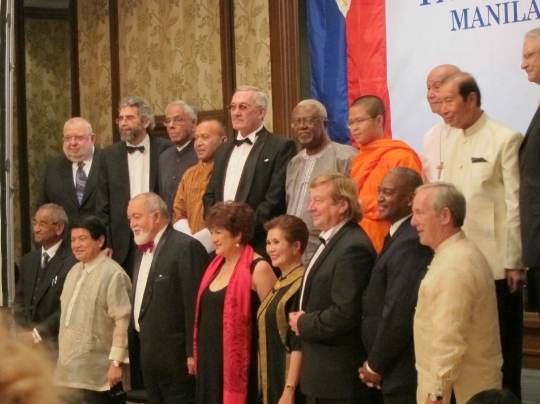 The Gusi Peace Prize is a charitable foundation, an institution based in Manila, Philippines, whose main objective is to give proper recognition through the confirment of awards of excellence and distinction to individuals or groups worldwide who have distinguished themselves as brilliant exemplars of society or who contributed towards the attainment of peace and respect for human life and dignity. The Gusi Peace Prize was established through the support of the friends of the Gusi family, who share the same mission and vision. The mission of the Gusi Peace Prize is to champion human rights and maintain governance, democracy, equality, international peace and goodwill. The writer began to live independently early and separately from his parents at the age of 16. Since 1974 he lived and worked in Novosibirsk. At the beginning of Perestroika in USSR Vladimir Megre was the president of Inter-regional Associations of entrepreneurs in Siberia. In 1994–1995 he organized two large-scale trading expeditions around the river Ob by ships travelling through the route Novosibirsk — Salekhard — Novosibirsk. There, in the Siberian taiga, he first met Anastasia who has changed his life. For a long time it was a mystery for the writer’s friends and relatives what made the entrepreneur with 10 year’s work experience in this field spend all his financial capital including the property sold for the organization of the expeditions that were not covering the expenses. This mystery is exposed in the books, the main character of which is Anastasia. From the expedition Vladimir has brought something that is hard to compare with the equivalent of money. Many significant changes influencing the world perception and lifestyle have occurred in the life of the writer after meeting Anastasia. Today more than 10 million copies of «The Ringing Cedars of Russia» series of books have been published and sold throughout the world and within Russia alone. Vladimir was writing book by book without hoping for appreciation. First the books were strictly criticized by press and even laughed at. But Vladimir kept on writing. Just 4 years after the publication of another book, Co-creation, Anastasia’s words have proven to manifest in reality. Many readers of «The Ringing Cedars of Russia» series have had a huge impact by her words and have changed their lifestyle as guided by Anastasia. In this 4th installment, Co-creation, Anastasia talks about the family estates that are going to change the lives of people, the lands and the government. Today, our own eyes are a witness to this change. Indeed, a great change it is! Anastasia’s firmly rooted the true meaning of «Motherland» in our minds. The events symbolizing the lifestyle evolution in Russia are taking place. A wonderful event is taking place! People of different beliefs, nationalities and social status are uniting into groups. Today in Russia the readers of «The Ringing Cedars of Russia» series of books have created more than 200 settlements consisting of family estates. The author deeply believes that our planet will have a great future! On November, 22, 2011 at 06:30 pm the Exclusive Dinner of Laureates took place at Philippine National Police Multipurpose Hall Camp Crane, where the laureates of Gusi Peace Prize International 2011 met each other, gave their speech and shared their ideas with journalists. On November, 23, 2011 at 7:30 A.M. the wreath-laying ceremonies where the flags and pictures of the 15 awardees are usually displayed for 2 months took place at the Rizal Park. The laureates standing by the flags of their homeland were representing their country with gratitude. The wreath-laying ceremony was followed by the Welcome Dinner at Intercontinental Hotel at 7:00 pm. Mr. Vladimir Megre has greatly enjoyed the time he spent with other laureates, the kind and peaceful atmosphere, dances performed by people from different countries and the traditional Russian dance of the granddaughters of the laureate of Gusi Peace Prize 2011 Medikov Yan Yakovlevich who were also very pleased to take part in the wonderful event. The audience stood up and applauded the performers for the dynamic and exciting Russian dance! 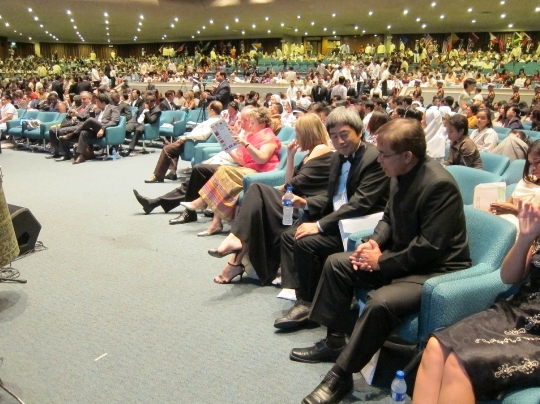 The 10th Annual Gusi Peace Prize International Awarding ceremonies which took place on November, 24, 2011 has touched the hearts of the laureates and the audience. 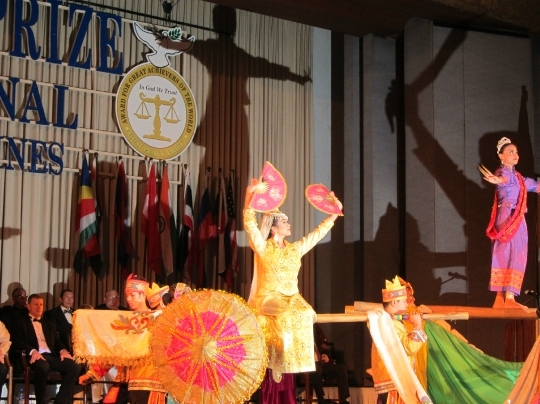 The bright performances of the actors from different countries of the world followed the honorable presentations of the laureates and the awarding of each Gusi Peace Prize 2011 laureate. 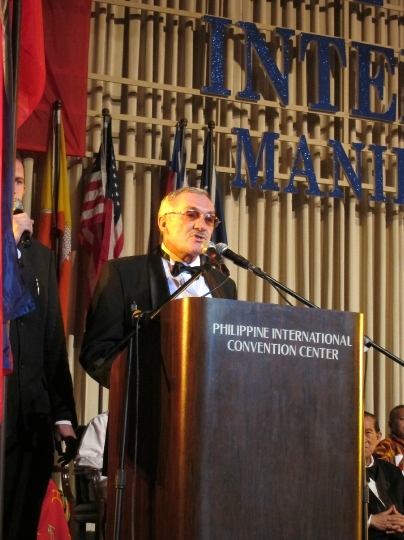 Mr. Vladimir Megre has welcomed all the laureates and thanked everybody for acknowledgement and appreciation in Manila, Philippines. According to the writer, the image of the main character of «The Ringing Cedars of Russia» series of books http://www.vmegre.com/en/books/) Anastasia is always with him wherever in this world he might go. «There are many wonderful women in this building. And I wish all the audience, ladies and gentlemen sitting here and sitting at the stage… I wish them to have their own Anastasia, a strong and wonderful woman who would be able to turn much in this world into peace. Thanks to all the women». The audience bursts with applauds. An award for all the audience was the wonderful performance, the mini show of PERPETUUM DANCE COMPANY actors from Serbia specially invited by Vladimir Megre for participation in the event. The bright ceremony was running for 5 hours and ended with the sign of goodwill. Ambassador Gusi released a white dove as part of the ceremony. The dove, being a symbol of peace, appropriately landed on the word «peace» in the signature above the stage.